Maple leaves changing color in early September. As my week long vacation approached a couple weeks ago, I was trying to decide whether to backpack in the San Juans or head north to Glacier National Park. The forecast of snow for the National Park made it an easy decision; nothing beats early season snow! 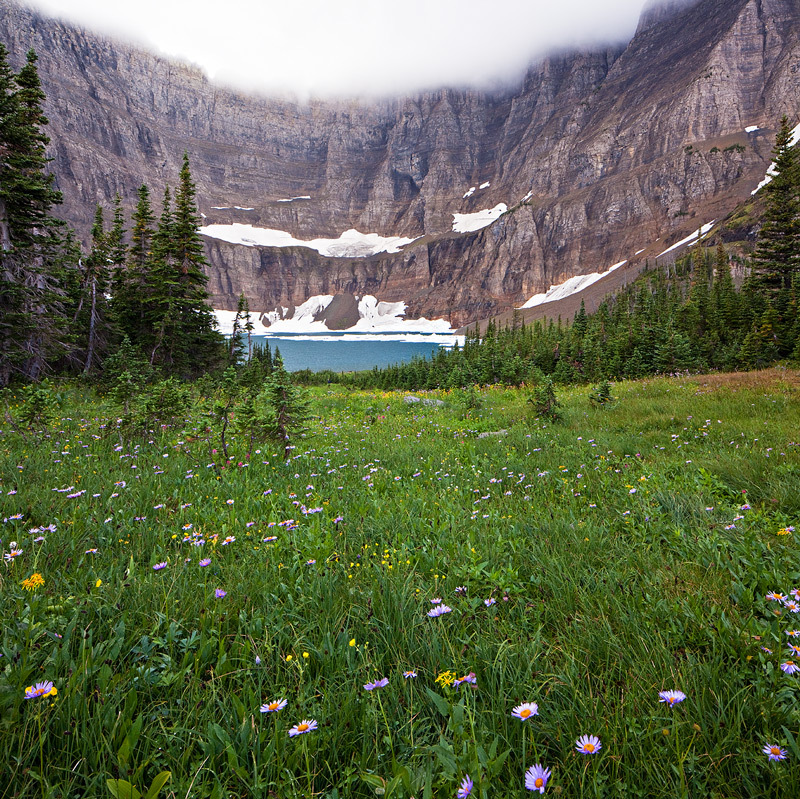 Plus, I hadn’t been up in Glacier since I was a kid, and I was anxious to get back. This time, I hit all the touristy spots–hopefully I can hit the backcountry for my next visit. As the top photo shows, Fall was already well underway in Glacier even though it was Labor Day. 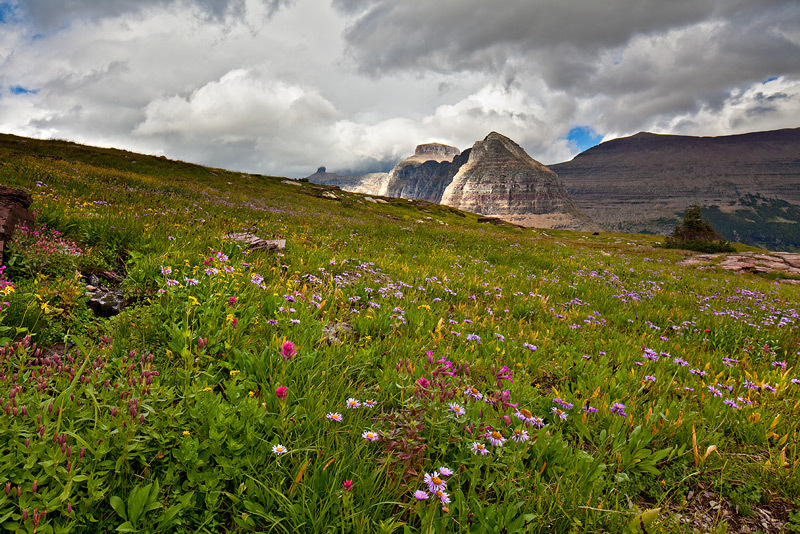 I started my trip with a hike up to Iceberg Lake near Many Glacier; as the photos that follow show, it was a rather showery afternoon (I got drenched by cold wind-driven rain at the lake) but the summer wildflowers were still going strong. 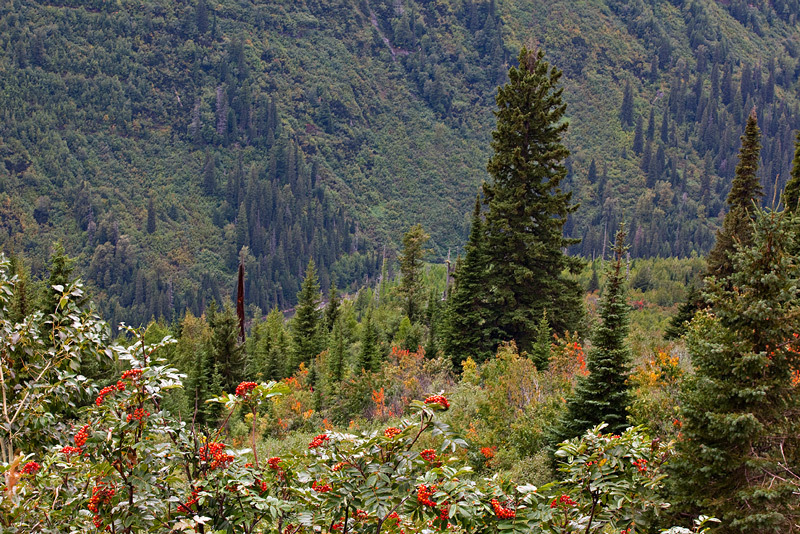 Flowers still going strong in early September in the Glacier high country. I went to St Mary Lake for sunset. I had seen a lot of shots taken at sunset from various vantage points along the lake. I hadn’t researched shot locations beforehand, but it was pretty obvious from the terrain where the best vantage points were. I just picked the first turnout off the road and made a bee line for the lake shore down a little ‘trail’ that quickly turned into a semi-bushwack, probably carved out by other photographers since I quickly recognized the landscape from photos I had seen of the lake. It was a nice windy sunset with lots of waves crashing on the rocky shore! 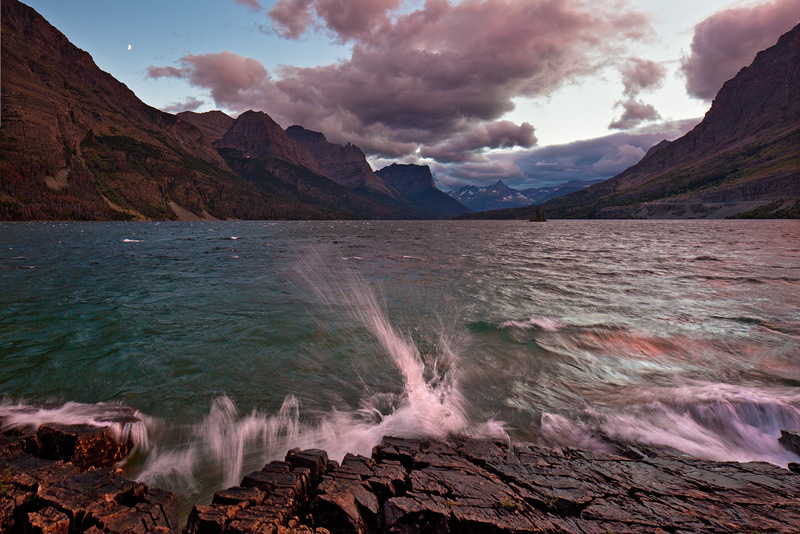 Waves break across the rocks at St. Mary Lake as a September storm approaches. Note the quarter moon rising. The next morning, I set up for sunrise at Two Medicine. The clouds were already on the way from the upcoming storm, enough clouds to prompt one photographer from Texas to take off from the lake shore before sunrise. This left one other photographer and myself at the shoreline waiting for sunrise, and sure enough, the clouds broke in time for a colorful post-sunrise display. As I have learned time and time again, when it comes to sunrises and sunsets–it aint over til it’s over! 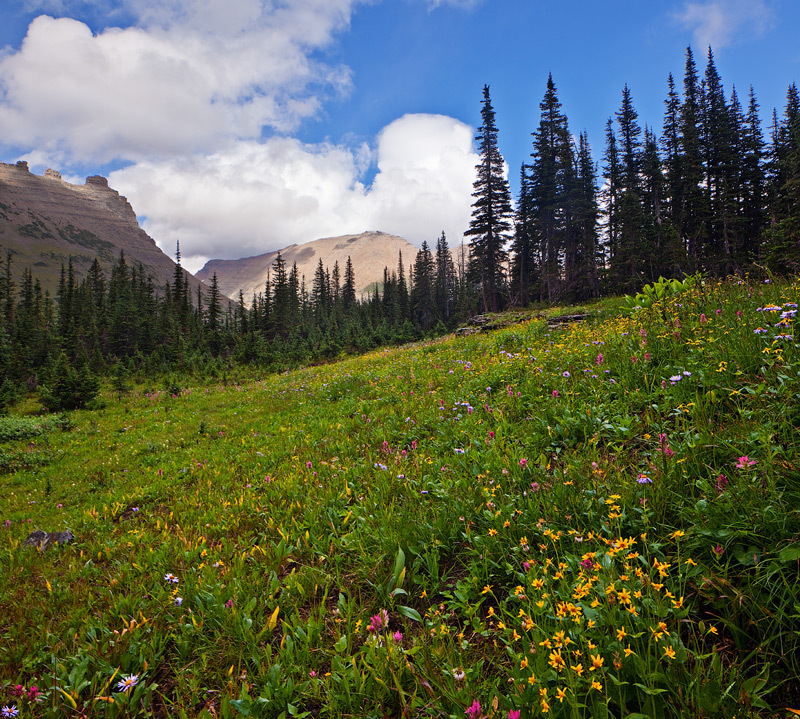 Fields of flowers near Logan Pass in Glacier NP. A mix of colors in early September along Going to the Sun Highway. The rain began falling that night, and the NWS put out a snow advisory for Logan Pass and the high country for 3-6 inches of snow. 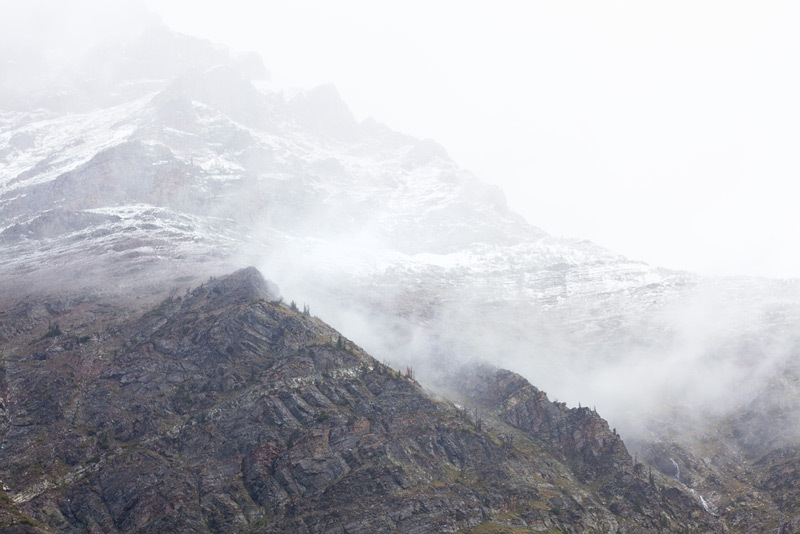 I was hopeful; my goal was to photograph an area near Logan Pass after the fresh snowfall. I sent the next day waiting out the weather. I hiked to a few waterfalls, but the showers were plentiful and it was a better excuse to try some of the beers at St Mary Lodge… Next blog entry: the photos from after the storm. Hint: the 3-6 inches didn’t materialize–most of the snow was 1,000 feet higher up. Here’s a shot from the day of snow and rain, see y’all next blog entry! Snow Line at about 6,500 feet. Love that cirque holding Iceberg Lake. Wildflowers are one of my favourite delights of climbing late in the season. All one must do to prolong Spring is hike higher!